I’ve been thinking of writing a post about vehicles in the Mario games, but I soon came to the conclusion it was difficult to determine exactly what counted. If you wanted to, you could technically count anything from the moving platforms in just about every game to Kuribo’s Shoe. I guess the first sort of vehicle the player, and hence Mario, could control, however, would be the flying carpets in Super Mario Bros. 2. You can only fly them for a few seconds, but they will move the way you want them to for that brief period of time. In the games where you can ride Lakitu’s cloud, it works much the same way. Kuribo’s Shoe will last until the end of the level. 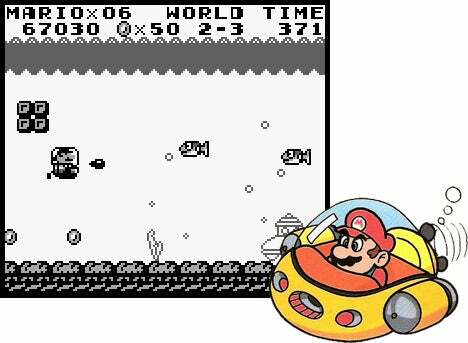 In terms of more traditional types of transportation, we can look at Super Mario Land, in which Mario pilots a small submarine and airplane. These are called the Marine Pop and Sky Pop, respectively. I’m not sure what the deal is with those names. If he rode in a balloon, the Pop part would actually make sense, although it would probably be seen as a bad omen. Anyway, both conveyances fire projectiles at enemies, and are each used in one stage. After Mario rescues Princess Daisy, he flies with her in a somewhat larger plane. The plumber can also pilot a helicopter, as seen at the end of Wario Land when he takes the statue of Peach that Wario found. Mario can be kind of a jerk sometimes, can’t he? We know from Super Mario Sunshine and Mario & Luigi: Superstar Saga that the Mushroom Kingdom has its own airline. In addition, there are the go-karts from the Mario Kart series and the Starship Mario from Super Mario Galaxy 2. The latter is shaped like Mario’s head, but I don’t know that this was his idea. At least it’s not called the Space Pop. It’s really more of a steerable planetoid than a traditional spaceship, and it runs on power stars. I guess the smokestack at the top is for exhaust. One sort of vehicle we don’t see much is the standard automobile, although they apparently do exist in the Mushroom World, because they’re obstacles in some Mario Kart course. Why the flying shell anyone would hold a kart race on a heavily trafficked highway isn’t something on which I’m prepared to speculate. According to the Mario Wiki, Wario owns his own car, but none of the other major characters do. It’s a status symbol of sorts, I suppose. For what it’s worth, the cartoons occasionally put the heroes and villains in cars, and there was even a place called Car Land. Even there, however, makeshift vehicles made out of bathtubs and such were more common. Mario and his companions did enter outer space in the cartoons long before they did so in the actual games, once in a ship with meatball cannons and another time in a craft called the Flying Pizza. This entry was posted in Mario, Super Mario Bros. Super Show, Television, Video Games and tagged automobiles, cars, marine pop, mario & luigi superstar saga, mario kart, princess daisy, sky pop, starship mario, super mario galaxy 2, super mario land, super mario sunshine, transportation, vehicles, wario. Bookmark the permalink.